Epigenetic therapy is a new treatment that seeks to reactive cellular mechanisms that prevent mesothelioma tumor growth. Epigenetic therapy works by altering cell expression. While still in early phases for mesothelioma, it has shown success in other cancers. Clinical trials are testing epigenetic therapies alone and combined for mesothelioma. Researchers hope targeting the epigenome can treat and prevent mesothelioma. Epigenetic therapy is a relatively new treatment that is related to gene therapy, as the treatment looks at changes in the DNA. However, unlike gene therapy, which works to alter the DNA sequence, epigenetic therapy focuses on changes in DNA expression. Epigenetic changes in the cells are natural and normal, but can be altered by factors like age, lifestyle and toxic exposures. Researchers realized that patients with mesothelioma and other cancers have epigenetic mechanisms that deactivate cellular antitumor systems, thus allowing tumors to develop. By better understanding the role of epigenetics in cancer, researchers hope to develop more drugs that can combat these changes and help reactivate cellular systems to prevent mesothelioma tumor growth. Researchers have found that flawed epigenetic patterns are common characteristics of many types of cancer cells. Changes in the epigenetic pattern can lead to tumor-suppressing genes being turned off or activating gene mutations, which can then cause tumor development. Epigenetic modification has a strong influence on cell regulation and function, like inhibiting genes that are involved in DNA repair, cell cycle regulation, drug resistance, metastasis and angiogenesis (blood vessel growth). With so many factors that can be influenced by epigenetic alterations, researchers have sought to develop drugs that can reverse the cellular changes and create a healthier cell environment, essentially returning the cells to their pre-cancerous state. Epigenetic therapy has been explored as a treatment for pleural mesothelioma, since researchers noted that the cancer often has rather poor response rates to traditional treatments and studies suggest epigenetics to be a contributing factor. In general, there are two basic types of epigenetic therapies that are being tested for mesothelioma and other cancers by targeting specific proteins and enzymes in the body. These therapies have already shown success in treating lung cancer, breast cancer and lymphoma. Researchers have tested a variety of drugs that target HDACs or DNMTs to treat pleural mesothelioma, with mixed results. Many of these clinical trials are still in the earlier phases, with a focus on understanding combinations of epigenetic therapies with other treatments to improve efficacy. A number of epigenetic therapy drugs, sometimes labeled as chemotherapy drugs, are FDA approved to treat various solid tumors, cancers and other health conditions. Since epigenetic drugs are sometimes called chemotherapy drugs, many clinical trials have tested these new treatments in combination with chemotherapy. One study treated 45 pleural mesothelioma patients with HDAC inhibitor valproate (also referred to as valproic acid) and chemotherapy drug doxorubicin. Patients underwent one to six cycles of treatment, with mixed success. Median progression-free survival was just 2.5 months, with only 25% of patients surviving one year or longer. Overall, though, the researchers noted that the treatment was safe and could be an effective regimen for patients with recurrent epithelioid pleural mesothelioma. Another epigenetic drug, vorinostat, was used in a similar phase III study of patients with recurrent pleural mesothelioma who had previously been treated with chemotherapy. Researchers concluded the drug was ineffective on its own, as survival was extended to about 31 weeks compared to 27 with the standard of care. Despite poor results in some of these trials, researchers continue to explore the effects of epigenetic regulation and potential multimodal approaches. Various studies suggest epigenetic therapy combined with immunotherapy could lead to improved outcomes and lengthen life expectancy. While clinical trials so far have shown mixed results for mesothelioma, researchers are still hopeful as epigenetic treatments have proven successful for other health conditions. 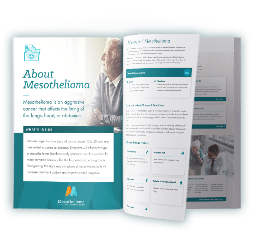 Though the efficacy of the treatment in extending survival may differ widely by patient, researchers have noted that overall it’s a safe treatment that may work best as a second-line cancer treatment for recurrent mesothelioma. So far in clinical trials, researchers have noted that epigenetic therapy is generally less toxic than standard treatments like chemotherapy and has fewer side effects. Many of the risks experienced with epigenetic therapy can be reduced with lifestyle or dietary changes, as well. There are currently several mesothelioma clinical trials involving epigenetic therapy. With further research, researchers hope this cancer therapy could eventually become an effective first-line treatment.